Protects the Pokémon from damage from weather. X It is encased in a steel shell. Its peering eyes are all that can be seen of its mysterious innards. X Dieses Pokémon ist von einer Stahlhülle umgeben. Seine stechenden Augen sind alles, was man von ihm sieht. X Il est prisonnier d’une coquille d’acier. Ses yeux vigilants sont la seule partie visible de son corps. X Se protege con su concha de acero de tal manera que solo se pueden ver sus ojos. X È incassato in una conchiglia d’acciaio. A parte gli occhi scrutatori, nessuno sa cosa ci sia all’interno. X 강철 껍질이 몸을 보호하고 있다. 틈새에서 엿보고 있는 눈이 있지만 내용물의 정체는 수수께끼다. Y It remains immovably rooted to its tree. It scatters pieces of its hard shell to drive its enemies away. Y Es bleibt stets bei seinem Baum. Es verstreut Teile seiner Schale, um so seine Feinde zu verjagen. Y Il est totalement fixé à son arbre. Il lance des morceaux de sa carapace pour faire fuir son ennemi. Y Permanece inmóvil agarrado a su árbol. Dispara trozos de su dura coraza para alejar al enemigo. Y Rimane saldamente attaccato al suo albero. Tiene lontani i nemici lanciando pezzi del duro guscio. Y 나무에 붙어 있는 채로 안 움직인다. 단단한 껍질 파편을 흩뿌려서 다가오는 자를 쫓아버린다. 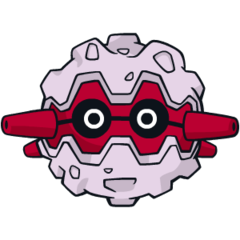 Omega Ruby Forretress conceals itself inside its hardened steel shell. The shell is opened when the Pokémon is catching prey, but it does so at such a quick pace that the shell’s inside cannot be seen. Omega Ruby Forstellka versteckt sich in seiner stahlharten Schale. Die Schale öffnet sich, wenn es nach Beute schnappt. Dies geht jedoch so schnell, dass man das Innere der Schale nicht zu Gesicht bekommt. Omega Ruby Foretress se cache dans sa carapace en acier trempé. La carapace s’ouvre quand il attrape sa proie, mais cela se passe tellement vite qu’il est impossible de voir à l’intérieur. Omega Ruby Forretress se esconde dentro de su concha de acero reforzada. Solo la abre cuando va a atrapar a su presa, pero ocurre tan rápido que no da tiempo de ver su interior. 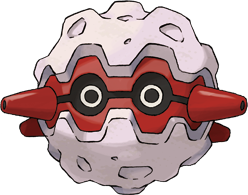 Omega Ruby Forretress si nasconde all’interno della sua conchiglia d’acciaio temprato. La conchiglia si apre soltanto per catturare la preda, ma il Pokémon ha una rapidità tale che non è possibile osservarne l’interno. Omega Ruby 강철 껍질 안에 본체가 있다. 먹이를 잡을 때 껍질이 열리지만 너무 빨라서 안이 보이진 않는다. Alpha Sapphire Forretress conceals itself inside its hardened steel shell. The shell is opened when the Pokémon is catching prey, but it does so at such a quick pace that the shell’s inside cannot be seen. Alpha Sapphire Forstellka versteckt sich in seiner stahlharten Schale. Die Schale öffnet sich, wenn es nach Beute schnappt. Dies geht jedoch so schnell, dass man das Innere der Schale nicht zu Gesicht bekommt. Alpha Sapphire Foretress se cache dans sa carapace en acier trempé. La carapace s’ouvre quand il attrape sa proie, mais cela se passe tellement vite qu’il est impossible de voir à l’intérieur. Alpha Sapphire Forretress se esconde dentro de su concha de acero reforzada. Solo la abre cuando va a atrapar a su presa, pero ocurre tan rápido que no da tiempo de ver su interior. Alpha Sapphire Forretress si nasconde all’interno della sua conchiglia d’acciaio temprato. La conchiglia si apre soltanto per catturare la preda, ma il Pokémon ha una rapidità tale che non è possibile osservarne l’interno. Alpha Sapphire 강철 껍질 안에 본체가 있다. 먹이를 잡을 때 껍질이 열리지만 너무 빨라서 안이 보이진 않는다. Gold Its entire body is shielded by a steel-hard shell. What lurks inside the armor is a total mystery. Silver It remains immovably rooted to its tree. It scatters pieces of its hard shell to drive its enemies away. Stadium2 Its entire body is shielded by a steel-hard shell. What lurks inside the armor is a total mystery. Ruby Foretress conceals itself inside its hardened steel shell. The shell is opened when the Pokemon is catching prey, but it does so at such a quick pace that the shell's inside cannot be seen. Sapphire FORRETRESS conceals itself inside its hardened steel shell. The shell is opened when the POKeMON is catching prey, but it does so at such a quick pace that the shell's inside cannot be seen. FireRed It remains immovably rooted to its tree. It scatters pieces of its hard shell to drive its enemies away. LeafGreen Its entire body is shielded by a steel- hard shell. What lurks inside the armor is a total mystery. Emerald It keeps itself inside its steel shell. The shell is opened when it is catching prey, but it is so quick that the shell's inside cannot be seen. Diamond It is encased in a steel shell. Its peering eyes are all that can be seen of its mysterious innards. Pearl It is encased in a steel shell. Its peering eyes are all that can be seen of its mysterious innards. Platinum It is encased in a steel shell. Its peering eyes are all that can be seen of its mysterious innards. HeartGold Its entire body is shielded by a steel-hard shell. What lurks inside this shell is a total mystery. SoulSilver It remains immovably rooted to its tree. It scatters pieces of its hard shell to drive its enemies away. Black It is encased in a steel shell. Its peering eyes are all that can be seen of its mysterious innards. White It is encased in a steel shell. Its peering eyes are all that can be seen of its mysterious innards. Black 2 It is encased in a steel shell. Its peering eyes are all that can be seen of its mysterious innards. White 2 It is encased in a steel shell. Its peering eyes are all that can be seen of its mysterious innards.